Seeing laundry hanging on bamboo poles is an everyday experience in most of China. I've seen all manner of clothing, bedding, household linen, and plush fake-fur rugs stenciled with the outlines of tigers. 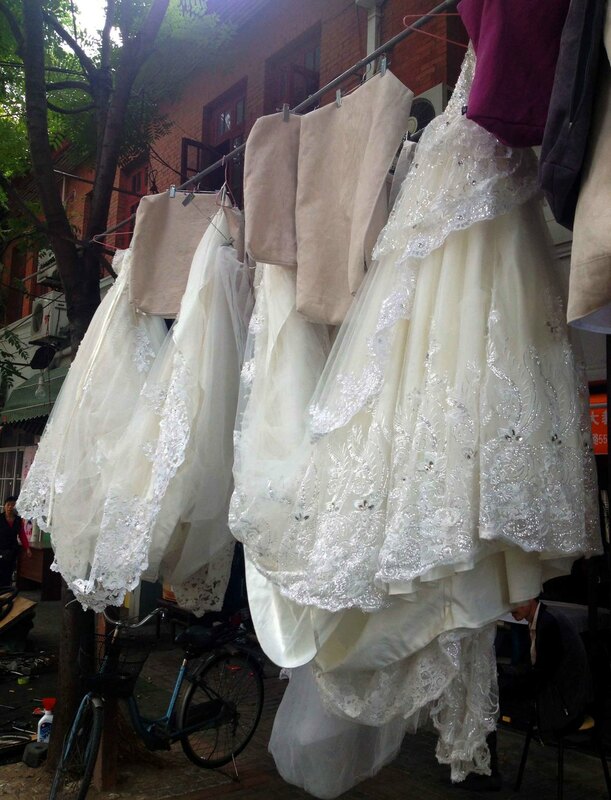 Today brought something new to see on the laundry line - wedding dresses! These are most likely prop dresses. Wedding photos are a big deal over here, and are done separately from the wedding itself. People will often rent Western-style wedding clothes (sometimes several different outfits) to be photographed in various locales - often snarling sidewalks and streets with large entourages of off-camera bridesmaids, friends and and assistants, and daring life and limb with mid-traffic poses. Another thing I haven't seen before is this many eggs in one pot. These are most likely about to be boiled in tea for several hours to become tea eggs. Tea eggs are a popular snack in China, and easy to find anywhere dumplings or breakfast foods are sold. Eaten throughout the day, they're pretty tasty - salty and rich - with a network of dark brown veins on the surface of the egg white where tea has seeped in through cracks in the shell.